Our #TransitHubbing Adventures in Toronto: #YongeDundas Featuring ING DIRECT Downtown Café! 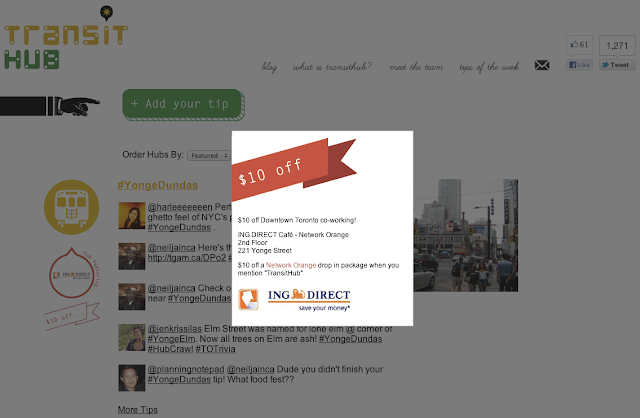 TransitHub is truly excited to welcome ING DIRECT Downtown Café as a featured business on transithub.ca. The ING DIRECT Downtown Café will be featured at the #YongeDundas Hub. As you can see on transithub.ca, ING DIRECT is offering #TransitHubbers a very special limited-time offer of $10 off a Network Orange drop-in package at their collaborative workspace. That represents a 50% discount, wow! The Network Orange workspace is ideal for entrepreneurs, freelance professionals and business travellers or even for employees of small or large businesses. The shared facilities have desk space, modern meeting rooms, Wi-Fi and other amenities that you would expect. ING DIRECT and TransitHub working together! If you haven’t been to the café before, you have to check it out. Once you jump out at Dundas subway station, it’s just a short walk south of the #YongeDundas Hub. You’re greeted by the warm ING staff dressed in orange. There’s comfortable seating, newspapers and magazines as well as freshly squeezed orange juice, tea and coffee. On many days of the week, community events are happening here too. Get your coffee or orange juice fix! There’s always something to discover in this modern facility. I’ve been here a bunch of times and didn’t realize until last time that there are two plant walls. How did I miss that? Now I know where all that clean oxygen was coming from! So, remember, to get the deal, just walk in to the café, say “TransitHub” and, boom, you’re all set! P.S. Do you want to be featured? If you’re looking to promote your business, a TransitHub-specific deal or an event at one of our hubs, contact me personally at neil.jain@transithub.ca.